HR faces the challenge of keeping up with a constantly evolving internal and external business landscape. But how do businesses rate HR preparedness for 2020? Eversheds and Winwark’s survey reported that HR functions, in general, scored just over 3 out of 5 for their level of preparedness to meet organizational needs and requirements in the year 20201. The question remains how the business will rate HR preparedness for 2020. HR faces the challenge of keeping up with a constantly evolving internal and external business landscape. It is therefore not surprising that HR leaders find the future daunting. Over the last decade, there have been a plethora of programs and initiatives that HR has been implementing, executing, tracking, and enhancing – HR Business Partner model, performance management, succession planning, career management, leadership development, assessment centers, employment branding, engagement, workforce forecasting, and the list goes on. However, there has been very little time dedicated to forward-looking strategies and the proactive origination of business aligned talent practices. HR as a function has continued to experience significant transformations since the 1990s largely driven by the business, technology, globalization and other external market conditions. The core mindset of HR has shifted from being transactional to strategic, process-driven to data-driven, policies to cultural practices, efficiency to effectiveness, skills to capabilities, talent integration to talent differentiation, and cost center to competitive advantage. There are numerous contributors in the field who continue to propagate the urgency for HR to be true business advisors, talent champions, culture stewards, and data scientists. Yet, HR continues to be constantly occupied with resolving immediate crises and launching under-resourced initiatives, many of which will not be completed. It is as though HR is always working from behind, struggling to catch up; skating to where the puck is instead of where it’s going. It is time for HR to take on a mission-critical, strategic planning approach now in order to better support the fulfillment of business goals in the years to come. 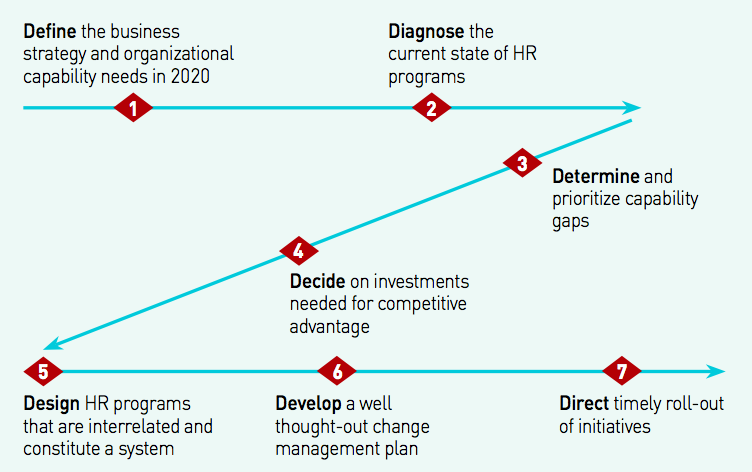 If you are an HR leader who is feeling the need to step up to better support your business, below is the recommended HR strategic planning methodology for 2020. Define the business strategy and organizational capability needs in 2020. The first step requires HR leaders to adopt an inquiry-based method to gain a deep understanding of the business strategies for the next 3-5 years as well as their human capital implications. Stakeholder interviews with key business leaders can be conducted to gather information on: (a) key business challenges that must be addressed, (b) business initiatives that will need to be executed to address these challenges, and (c) capabilities and talent that will be critical to achieve the desired results. Diagnose the current state of HR programs. Measuring effectiveness of the current programs can be assessed by gathering feedback from internal customers (business leaders, line managers/supervisors, and front line employees), benchmarking against best practice organizations, and having HR delivery channels provide constructive input on what is and what is not working. An Effectiveness Survey with HR’s key customers followed up with focus groups can be enlightening especially with regard to verifying the value that HR is providing to the business. Benchmarking of operational as well as strategic metrics can be yet another valid point of reference. There is no greater resource to discuss the efficiencies and effectiveness of the current HR programs than the HR team members themselves. Determine and prioritize capability gaps. The directional information received on business strategies as well as the assessment of the current state of HR programs can be triangulated to identify gaps within the HR portfolio of programs and services. Besides identifying gaps, the goal of this step is to also prioritize HR programs based on impact and alignment to business initiatives. It will be an eye-opening activity for the HR team to compare and contrast where their time and efforts are being spent currently versus the desired future state. This step also highlights what actions will be necessary to better align with business priorities. Decide on investments needed for competitive advantage. It is important to ensure that there is an unwavering commitment as well as complete buy-in from senior business leaders on the prioritized HR focus areas. The HR leadership team needs to complete the required due diligence for each human capital strategy, determining whether it is more advantageous to buy or build such capabilities. Additionally, they ought to research the cost implications and work closely with Finance and other shared services to resource each initiative appropriately. It is important to ensure that HR examines its own internal resources. Does it have enough of its key positions staffed and budgeted? 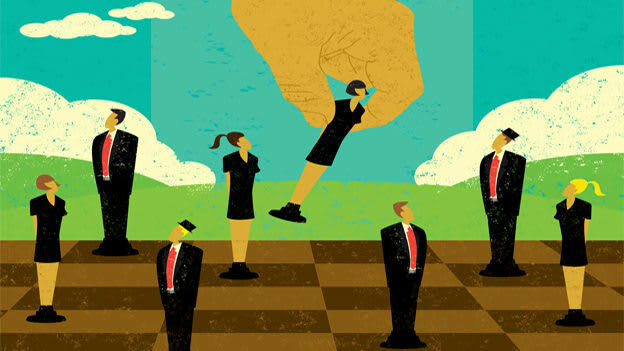 Are the people in those roles the right people, with the right skills for the future? This is an important step and may require several iterations until firm decisions can be made. Long range planning and budgeting are as vital to HR as they are to the rest of the enterprise. HR in 2020 must be more than just a necessary expense; it must show a return on investments made. Design HR programs that are interrelated and constitute a system. Once the priorities and programs have been finalized, HR team members can begin enhancing existing programs and/or designing new ones to address future human capital needs. One important consideration during the design step is to not create a collection of individual HR activities but a system of distinct and highly interconnected programs that contribute to the organization’s competitive advantage. Each program must be integrated with others to ultimately drive the desired business outcomes. Their underpinning must be consistent in focusing on the acquisition, development and retention of the critical capabilities that were identified as organizational gaps. The core teams that are responsible for design could encourage involvement from the business to ensure that priorities, resources and timelines are in-sync. High-level metrics that measure the impact of the program should also be agreed upon and finalized. Develop a well-thought-out change management plan. The plan to introduce the strategic programs to the business needs to be carried out thoughtfully. The goal should be to create value and demand for the enhanced programs. The pre-launch, launch, as well as post-launch activities have to be determined ahead of time. The communications plan could be vetted with a sample group of business leaders and line managers to ensure there is agreement and acceptance to the timing, messaging, etc. It is almost impossible to over-communicate during a change initiative. Some “quick win milestones” must be designed into the change process. Direct timely roll-out of initiatives. When it is time to launch the solution(s), it is essential for HR to affirm their value proposition to the business. Throughout the implementation, it is highly recommended that HR be watchful for the indications that the programs launched are effective. The design team should be open to feedback and make appropriate edits if necessary. It is evident that the global, political, economic and business environments are bound to continue to evolve up through 2020 – constant change is inevitable. This emphasizes the need for HR to be more aligned with the business and to participate in true long range planning. Where is your HR function heading over the next three to five years?